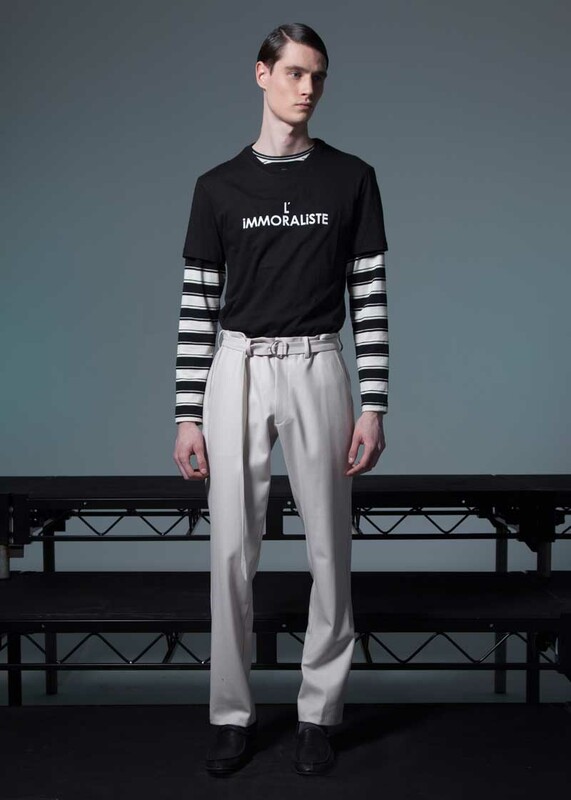 With a t-shirt proclaiming “L’Immoraliste” it was easy to discern that Lucio Castro’s inspiration for his Fall 2014 collection is the 1902 novel “The Immoralist” by French author Andre Gide. A story of sensuality and hedonism, “L’Immoraliste” was as shocking in 1902 as “Fifty Shades of Grey” in 2011 to polite society. Choosing to bring Michel, the hero of “L’Immoraliste” to the 21st century, Lucio Castro also brought forth his penchant for drama using colors and textures to bring it front and center. With dark green, gray and beige as the main color palette, the Argentinean-born designer demonstrated his mastery of the color wheel. And while [Michel] remains essentially French, the introduction of plaid and cowboy-dressing elements made him more American than European.